The neoconservative ethos, steeped in the teachings of Leo Strauss, cannot abide an America where individuals simply pursue their happy, peaceful, prosperous lives. It cannot abide an America where society centers around family, religion or civic and social institutions rather than an all-powerful central state. There is always an enemy to slay, whether communist or terrorist. In the neoconservative vision, a constant state of alarm must be fostered among the people to keep them focused on something greater than themselves, namely their great protector - the state. This is why the neoconservative reaction to Wikileaks revelations is so predictable. They say, 'See, we told you, the world is a dangerous place,' so goes their claim. 'We must prosecute or even assassinate those responsible for publishing the leaks. Then we must redouble our efforts to police the world by spying and meddling better with no more leaks,' so they say. Perhaps that's something to ponder as we consider why Obama has just reauthorized Bush's "national emergency" order for its 10th year. Ron Paul might be right. There might be an "enemy to slay." But are we focused on the wrong enemy? Consistent with section 202(d) of the National Emergencies Act, 50 U.S.C. 1622(d), I am continuing for 1 year the national emergency previously declared on September 14, 2001, in Proclamation 7463, with respect to the terrorist attacks of September 11, 2001, and the continuing and immediate threat of further attacks on the United States. 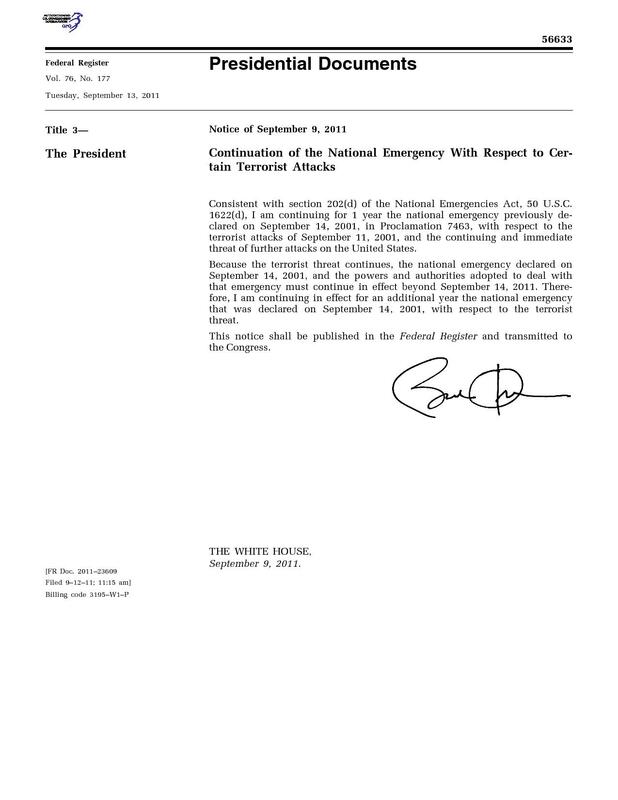 Because the terrorist threat continues, the national emergency declared on September 14, 2001, and the powers and authorities adopted to deal with that emergency must continue in effect beyond September 14, 2011. Therefore, I am continuing in effect for an additional year the national emergency that was declared on September 14, 2001, with respect to the terrorist threat. This notice shall be published in the Federal Register and transmitted to the Congress.